Previously, we examined the ecosystem view of marketing. 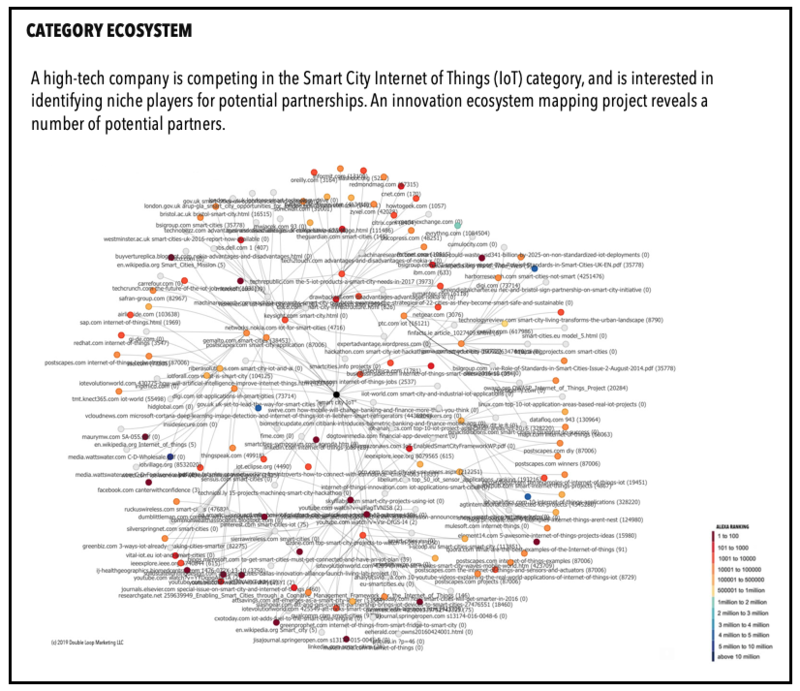 Now we turn to the innovation ecosystem – where do new ideas and capabilities come from? Almost everyone pays lip service to the idea of open-innovation – that coming up with new value in the marketplace often depends upon connecting effectively with other companies and individuals that are outside your company. How does your company identify, find and create new opportunities? We’re all familiar with Christensen’s “innovator’s dilemma” – the tough choice a company faces between incremental improvement or sustaining innovation, or capturing new markets by embracing technologies and new business models through disruptive innovation. Often, the choice is made by the leading customers in an evolving ecosystem, and companies would do well to monitor these shifts. Threats can be mitigated if they are identified early enough. Vigilance has become a key component of future decision-making. The innovation ecosystem consists of business participants, start-ups, academia, technical and support services, and the individuals that drive results. 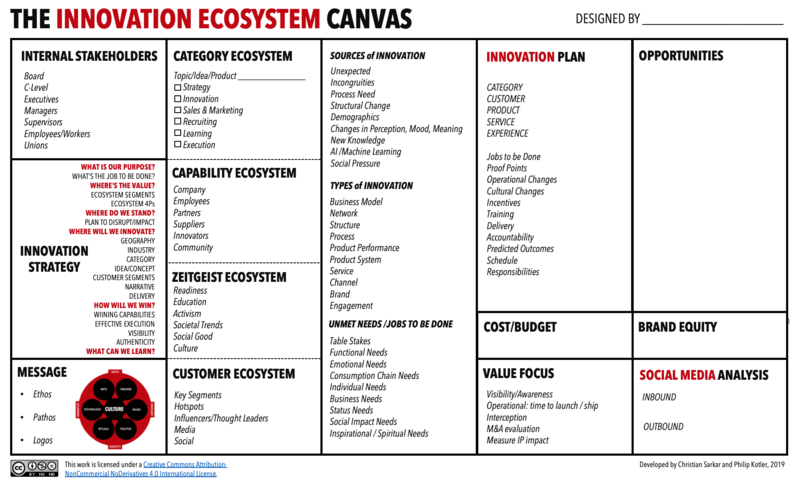 An ecosystematic approach to innovation is nothing less than a structured approach to analyzing the innovation system. The goals are to identify and interact with the key innovators – the startups, the innovators, the technical network, the academics, and engage them if required to help develop your innovation capabilities. Where are the next generation of ideas and concepts coming from? How crowded is the innovation category we are interested in? Where exactly do we want to participate? What value do we bring to the existing category and customer ecosystem? Which emerging players in the ecosystem are getting the most traction? What unique capabilities do they have to solve the customer’s job to be done? How do we find the capabilities required to win? 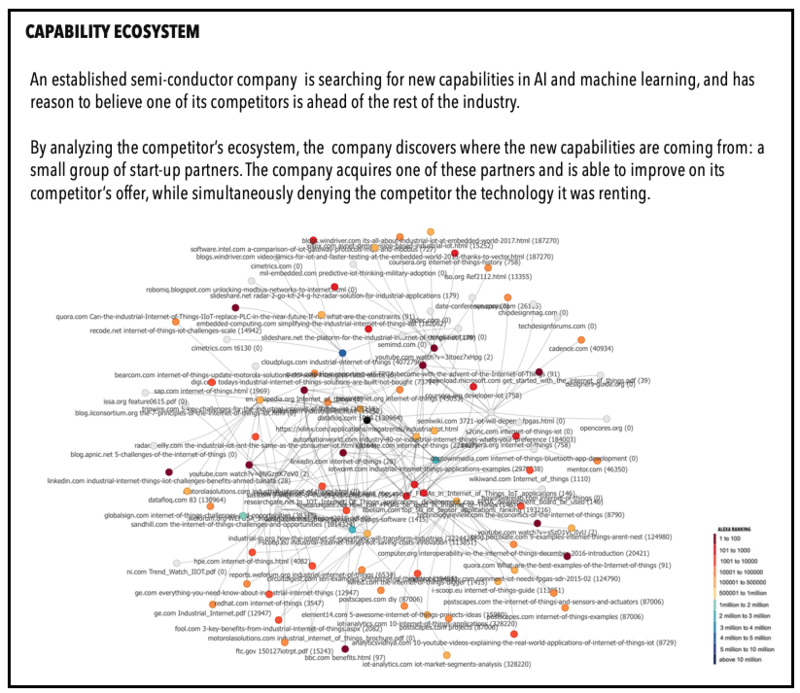 How well are our competitors positioned in the innovation ecosystem? Who are they partnering with? What message are we sending to the innovation ecosystem? Are we the first choice for start-up partnerships? Where should we start testing and scaling our jobs-to-be-done research? 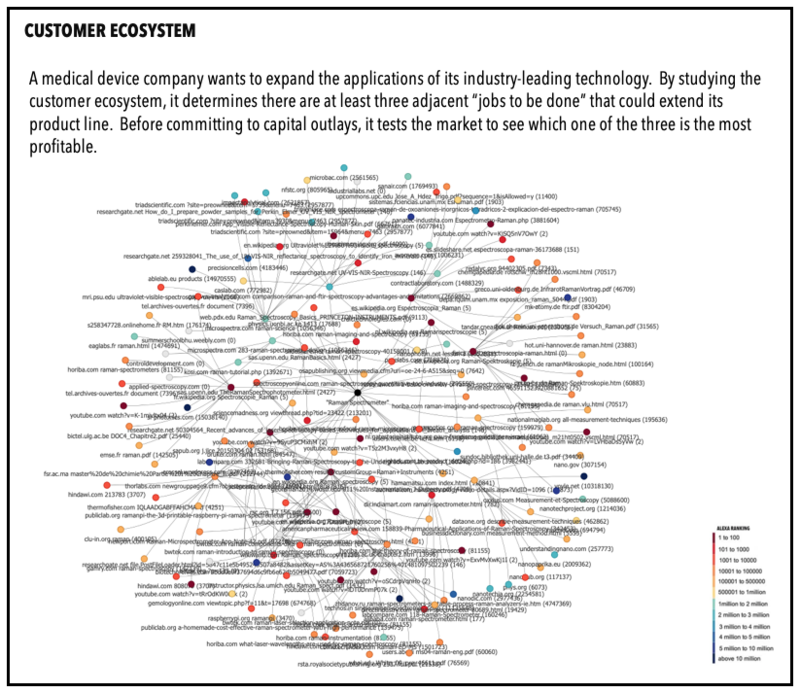 Analyzing the innovation ecosystem for a specific category can identify disruptive innovators as partners or candidates for acquisition. Where are the next generation of ideas, products, and services coming from? Are there disruptive companies we want to partner with or acquire? The earlier you identify innovative products and services the better. A capability ecosystem is usually based on a narrow technology or knowledge-based skillset that is continuously being upgraded. Finding these new capabilities and bringing them into your company is a key feature of innovation ecosystem engagement. Where will we find the capabilities we need to compete in new markets? Can we block our competitors from acquiring these capabilities? Often the best chance for success is to monitor leading developments in adjacent markets, and find ways to transfer those capabilities to yours. An unmet need in your market may already be satisfied in a similar market elsewhere in the world. To test the readiness of your market, you can employ a “strategic listening” program to measure interest. Is there an unmet need for our proposed product or service? What are the conditions under which our concept will sell? An idea whose time has come is the best opportunity to introduce a product that the consumer craves. 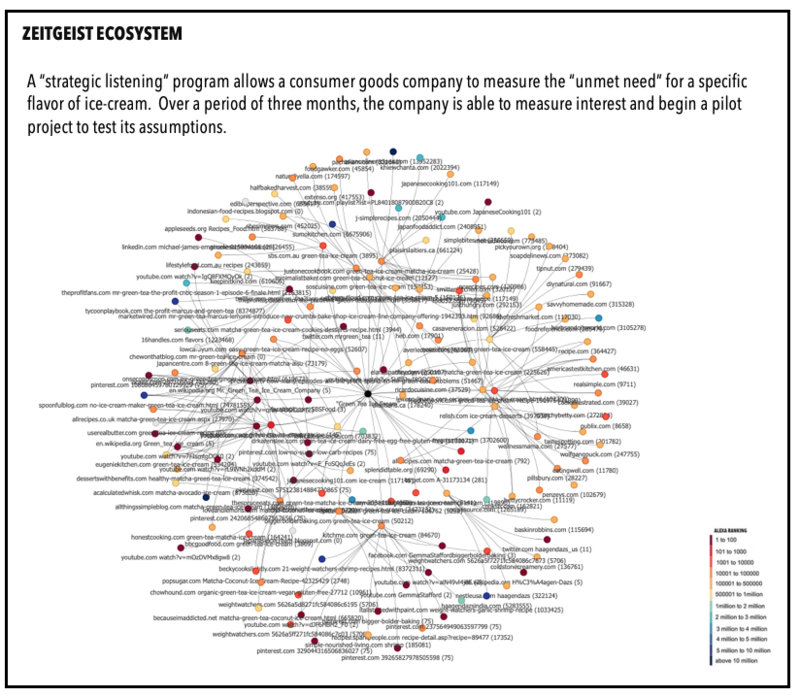 Understanding customer ecosystems can help businesses find new growth areas based on jobs-to-be-done. A technology or product platform may have many uses and applications. The trick is to find them. Are there unexpected applications or uses of your existing product? Can our technology be used to solve other needs? The key is to understand customer needs. One way to do that is by asking them. What new insights can we gain from the behavior of participants in the innovation ecosystem? We’ll add one more source of innovation – social pressure. What can we learn from the aspirational needs of the customer that are being left unmet? What does the zeitgeist tell us? An ecosystem approach to innovation management is more and more crucial as we pivot to an intelligent economy. Decisions are going to be made outside the company that greatly impact your future. The majority of new capabilities will come from outside your business, even outside your industry. Peter Drucker used to say that “Your first and foremost job as a leader is to take charge of your own energy and then help to orchestrate the energy of those around you.” That’s ecosystem strategy. Philip Kotler is the “father of modern marketing.” He is the S.C. Johnson & Son Distinguished Professor of International Marketing at the Kellogg School of Management at Northwestern University. He was voted the first Leader in Marketing Thought by the American Marketing Association and named The Founder of Modern Marketing Management in the Handbook of Management Thinking. Professor Kotler holds major awards including the American Marketing Association’s (AMA) Distinguished Marketing Educator Award and Distinguished Educator Award from The Academy of Marketing Science. The Sales and Marketing Executives International (SMEI) named him Marketer of the Year and the American Marketing Association described him as “the most influential marketer of all time.” He is in the Thinkers50 Hall of Fame, and is featured as a “guru” in the Economist. He is the author Confronting Capitalism: Real Solutions for a Troubled Economic System, 2015; and Democracy in Decline: Rebuilding its Future, 2016. Christian Sarkar is the editor of THE MARKETING JOURNAL, an entrepreneur, marketing consultant, and activist. He is the founder of Ecosystematic, an ecosystem visualization tool. See also the $300 House project and FixCapitalism.com. He is the co-author (with Philip Kotler) of Brand Activism: From Purpose to Action (2018).